O God, who was willing to join the blessed Matthias to the body of Your Apostles, by his intercession may we unceasingly enjoy the effects of Your mercy towards us. Amen. Saint Matthias had the joy of following Jesus Christ from the very start of His preaching. It is believed that he was one of the seventy-two disciples. After the Ascension of Jesus into Heaven, His disciples returned to Jerusalem. There in the Cenacle Room they awaited the coming of the Holy Spirit, all persevering in a spiritual union in prayer with Mary, the Mother of Jesus. The congregation, which numbered around a hundred and twenty people, approved by mutual agreement the counsel of the head of the new Church. They chose two disciples from among the seventy-two: Joseph, called Justus, and Matthias; their names were written on two pieces of paper and put into a vase. The gathering prayed and asked the One who penetrates the depths of hearts to be pleased to show them which of the two He chose to succeed the traitor Judas. 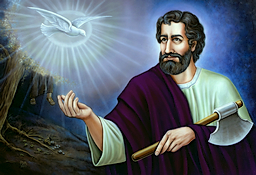 Saint Peter drew lots and read: “Matthias, disciple and Apostle of Jesus.” Saint Matthias was acknowledged and admitted as a legitimate Apostle, much to everyone’s joy. He began preaching to the peoples the ineffable mystery of the Cross, in great holiness of life and wonderful fervor of spirit. Saint Clement of Alexandria relates that in his instructions, Saint Matthias insisted especially on the necessity to mortify the flesh, to master it and always refuse what the disordered desires of sensuality seek. On the other hand, he said, we must work at strengthening the soul with the faith. When the Apostles divided among themselves the provinces that were to be evangelized, Judea fell to Saint Matthias. He preached there with such fervor that he converted many people to the Christian Faith, as Saint Isidore of Seville mentions. The Jews made implacable, continual war on him, because this holy Apostle clearly showed them the coming of the Messiah through the Scriptures. All the while continuing his preaching, Saint Matthias traveled to the faraway lands of Ethiopia and Arabia. After thirty-three years of preaching, he died a martyr for his faith, under the rule of Nero, in the year 63. In the West, it is generally admitted that he was stoned to death, and that if he was crucified as certain people maintain, he was taken down from the cross and finished off with an ax. Matthias the Apostle is illustrated holding an ax or a halberd. Because of this ax, he was chosen as a patron of carpenters. Saint Helen, the mother of Constantine, brought the holy body of the illustrious Apostle to Rome; part of his head and some other members are still in the church of Saint Mary Major. The Church has set the feast day of Saint Matthias the Apostle on February 24; on leap years, his feast day is moved to the 25th. Sources: M. J. Collin de Plancy, Grande Vie des Saints (Louis Vivès: Paris, 1878), Vol. IV, pp. 478-480; Fr. René Moreau, s.j., Saints et Saintes de Dieu (Alfred Mame & Fils: Tours), Vol. I, pp. 257-258; Msgr. Paul Guérin, Les petits Bollandistes, (Bloud & Barral: Paris, 1880), Vol. III, pp. 3-4. This article was published in the Magnificat Magazine, February 2018, available from Editions Magnificat.